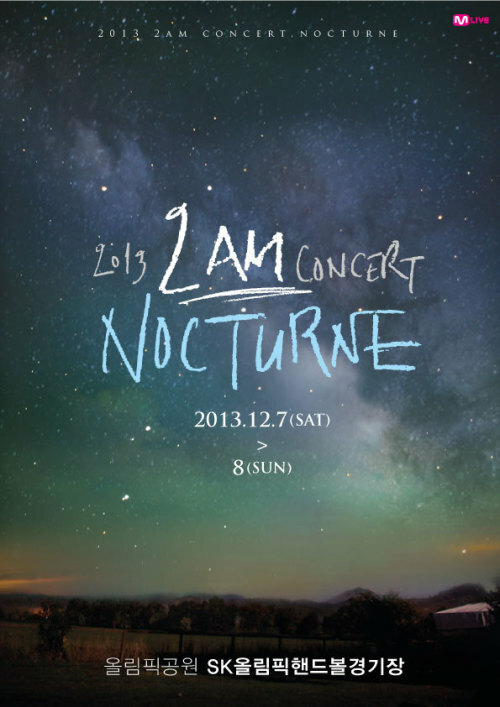 2AM이 오는 12월 서울에서 콘서트 ‘NOCTURNE:야상곡’을 개최한다. 지난 3월 정규앨범 ‘어느 봄날’ 이후 드라마, 영화, 예능 등 다양한 분야에서 개인 활동을 펼친 2AM이 오랜만에 완전체가 돼 팬들과 만난다. 2AM은 지난 2010년 크리스마스 콘서트를 시작으로, 연말마다 관객들과 함께해 오고 있다. 올해는 음악과 이야기를 결합한 신선한 뮤직 드라마 형식의 무대를 통해 연말 공연 강자로 발돋음하겠다는 각오다. 또한 이번 콘서트에서는 어디서도 볼 수 없었던 멤버들 간의 듀엣과 새로운 레퍼토리로 짠 개인 무대를 선보일 계획이다. 매니지먼트를 맡고 있는 빅히트엔터테인먼트와 공연 주최사 CJ E&M 음악사업부문 콘서트사업팀은 “감성적인 새벽 2시의 모습과 뮤직 드라마 그리고 멤버들의 색다른 4가지 매력을 느낄 수 있는 열정적인 새벽 2시의 모습까지. 다양한 무대가 펼쳐질 것”이라고 설명했다. 2AM has worked in a drama, movie, and entertainment in various fields individually since an album ’One Spring Day’. They will meet their fans together after a long time. Starting from a Christmas concert in 2010, 2AM has been being with their audiences at the end of every year. They made a resolution that they will become the hit of this concert at the end of year through the stage of fresh music drama style combined music and a story this year. Also they are planning to show duet among members on stage and an individual performer ordered with a new repertory that couldn’t see anywhere on this concert. BIG HIT ENTERTAINMENT in charge of management and a host of concert CJ E&M’s music business part explained "There will be a various stage performance from emotional scene to passionate scene which is possible to feel 4 different charms of each member at 2AM."